Discussing folding mechanisms with Rick at Clarks Fork Canyon, Wyoming. Photo by Hilary Close. The region of northwestern Wyoming and south-central Montana offers a wide variety of geology and earth science related attractions. The region’s diverse geologic features are a study of contrasts: Mountains that formed due to compression (Laramide uplift of the Wind River, Bighorn, and Beartooth Ranges) and extension (the Teton Range), rocks that are >3 BYO (basement rocks of the Beartooth Range) and that are forming today (tufa in Yellowstone), geological features that provide resources (oil fields and platinum mines) and hazards (active faults and volcanoes), all in remarkably close proximity. This nine-day field trip provided graduate students the opportunity to explore sites in this region of the American West and to share expertise in both field techniques and conceptual background for a wide range of topics, broadly: structural geology, tectonics, volcanism, geophysics, geomicrobiology, igneous petrology, economic geology, paleontology, wildlife and resource conservation, sedimentology and stratigraphy, fluvial and glacial geomorphology, and more. Click here for a virtual field trip, or here for more photos! 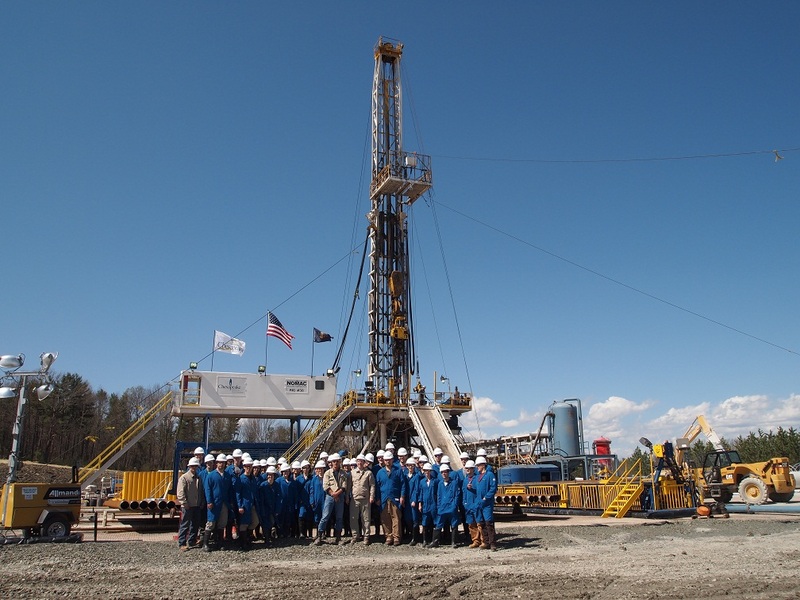 The group checking out the Chesapeake drill site in Bradford County, PA. This short field trip, newly developed this year for EPS 109 (Earth Resources and the Environment) provided a group of 40 undergraduate students the ability to gain hands-on experience with the past, present, and future of economic geology in the Mid-Atlantic states. Field stops included a tour of an active drill site for shale gas in the Marcellus Formation (courtesy of Chesapeake Energy), an abandoned sub-surface anthracite coal mine, an active surface coal mine (courtesy of Atlantic Coal Company), an acid mine drainage site, and the Franklin-Sterling Hill Zinc Mineral District. Discussions included the technologies used in extraction processes, the environmental impacts, and the geologic context of the formation of the resource deposits. Visits to active sites provided students the opportunity to ask questions and interact with experts and learn about the day-to-day operations of economic resource extraction. Click here for a virtual field trip, or here for more photos! 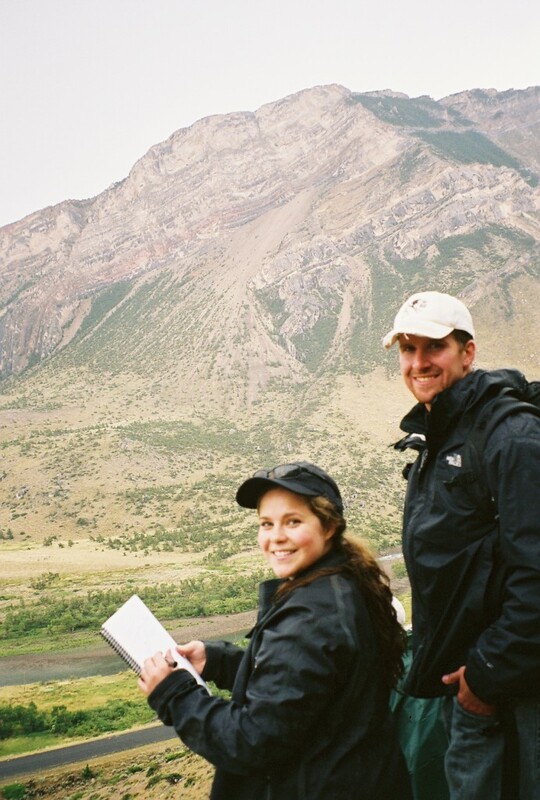 I assisted with several field trips by making improvements to existing field guides, planning logistics, and helping to lead the field activities. These include a number of field trips to the Canadian Rockies, Vermont, the Catskills and Adirondacks in New York, and New England coal and nuclear power stations as a teaching fellow for various courses. I have also been lucky enough to simply be a participant on several fantastic trips to New Zealand, Iceland, Arizona, the southwestern U.S., Maine, and Hawaii. You can see photos of all of these great trips in the photo gallery!